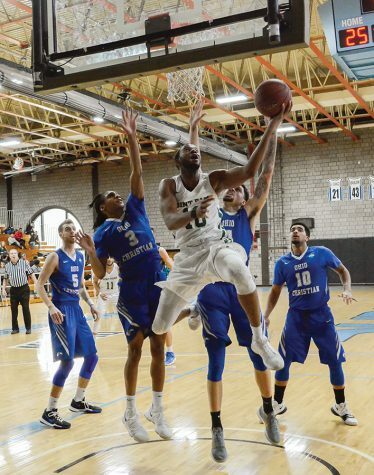 The Point Park men’s basketball team has not won a game since December 7, 2017. With two River State Conference (RSC) losses last week to No. 2-ranked Indiana University (IU) East and Ohio Christian University, the Pioneers’ losing streak now stands at 11 games. Senior forward Fousseini Konate goes up for a layup against Ohio Christian Saturday. Konate recorded his seventh double-double of the year. “Shockingly enough, we have a different starting lineup each game so it’s tough to play consistent,” head coach Gabe Bubon said. Point Park hosted Ohio Christian University on Saturday, celebrating 50 years of Point Park college basketball as well as Senior Day. “I couldn’t even sleep last night I was so excited,” said guard Rushan Roberts about his senior day. “I felt some type of way because I am going to miss my basketball family, my brothers,” senior forward Fousseini Konate said. Senior guard Gavin Rajahpillay played his final game at home Saturday. “If I need to sprain another ankle or tweak my hip again to get to the playoffs I’m going to do it,” Rajahpillay said. The Pioneers fell to Ohio Christian University 97-81, ultimately spoiling Rajahpillay, Roberts and Konate’s final home game donning the Pioneer green and gold. Ohio Christian was feeling it from outside the arc, as it buried 18 3-pointers in the RSC matchup, while shooting 55 percent from outside. The Pioneers were playing catch-up on the scoreboard as the first half ended, trailing 48-37 after initially leading 20-9 to open the game. “It is hard to stay at 100 percent the whole game on defense with only six guys in rotation,” Konate said. After being outscored in the second half 49-44, the 16-point loss casted a dark cloud over Point Park’s senior Day. The Pioneers shot 42 percent from the field and had only three bench points. Rajahpillay and junior guard Asim Pleas each had 19 points, accounting for 14 of the 31 total field goals made. Roberts had 15 points and nine rebounds and Konate tallied his seventh double-double this year with 11 points and 15 rebounds. The rematch against No.2-ranked IU East on Tuesday was pretty similar to the last time the two met in early January when they lost to the Red Wolves by 37 points. The Pioneers were unable to get revenge as they lost 105-71, shooting 43 percent from the field and getting out rebounded 50-24. The Pioneers grabbed just three offensive rebounds on the evening, something that has plagued them throughout the season as they have been lacking much-needed size and height in the paint. “When you have a bunch of 6’1” and 6’2” guys, it’s hard to compete,” Bubon said. Point Park was down 46-31 at the half and could not stop the offensive surge of IU East’s seven made 3-pointers. IU East then added another eight 3-pointers to its stat line in the second half, totaling 15 of the night. The Red Wolves shot 54 percent from the field and 40 percent from deep. Point Park was led by King’s 20 points. Pleas and Konate both aided the Pioneer offense with 18 points each. Konate tallied another double-double with ten rebounds after 34 minutes on the court. The Pioneers playoff window is small, but it still exists. Point Park can still make it into the RSC playoffs by winning at least three out of its last four games. “We can still go all the way to the championship game, so don’t count us out just yet,” Rajahpillay said. Point Park hits the road for their last four games in hopes of becoming playoff bound. The road journey began Tuesday at Carlow University and continues Feb. 13 at Rio Grande. “And so, the Cinderella story continues,” Roberts said.